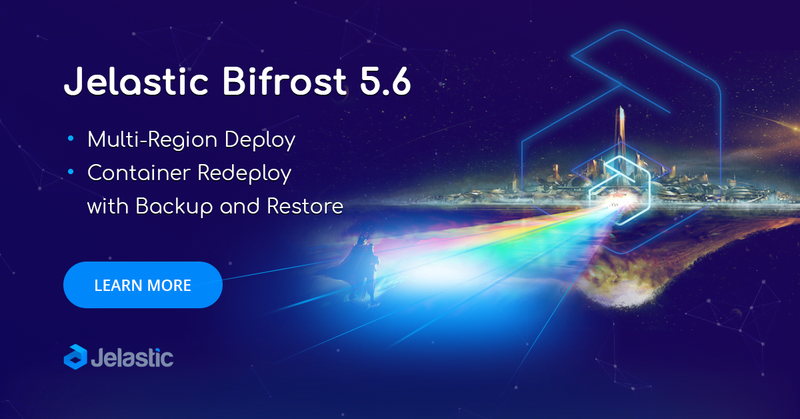 Jelastic Bifrost 5.6 version is released with ability to deploy packaged applications and services across multiple regions, automatic backup and restore of containers during redeploy, custom IPv6 firewall rules, as well as other improvements targeted on platform performance and usability. Jelastic Cloud Scripting provides the possibility to pack pre-configured applications, clusters, services and add-ons that afterward can be deployed in one click. Starting with 5.6 Jelastic release, customers can initiate the deployment of such packages across several regions of the chosen service provider. In combination with post deploy actions, the new release enables further automation for advanced scenarios to gain cross-region high availability, disaster recovery and geo-routing. “Multi-region deployment is unlocking the possibility to offer advanced geographical architectures or disaster recovery implementations, without any complexity for end-users or painful implementations for SysOps. Once more, Jelastic continues to amaze us with the limitless possibilities of cloud scripting,” Theodoros Filippidis, CEO at Scaleforce. Container redeploy is a powerful functionality to keep software solutions up to date. However, there are always risks of incompatibility with the new container version. As a result, the project can become partially or entirely unavailable till the problem is resolved. Aiming to eliminate even a slight possibility, Jelastic PaaS developed a new algorithm for containers redeploy that includes backup creation. So if an error occurs during container update, the platform automatically and painlessly restores previous version with comprehensive notification within the dashboard. Most of the firewall configurations can be performed via the dedicated user interface, which allows configuring the inbound and outbound rules. Herewith, for more flexible management custom firewall rules can be set for container. Current 5.6 platform release extends the functionality by adding possibility to create custom rules for the IPv6 connects via intuitive UI. A full list of features and improvements included to the Jelastic Bifrost version can be found within Release Notes 5.6. Explore the updates at one of the Jelastic service providers.